No, no, no, not accepting that Summer is over. Yes, confirmed by my favorite weatherman, Tom Skilling, it is now officially Fall. And indications of the season are confirming said season change — apples, pears, and pumpkins, yeah, pumpkins have shown up to the party that I am not quite ready for. I love what the Fall harvest has to offer, but I am still trying to hang on desperately to Summer, especially after a wonderfully warm Fall thus far. The blustery weather I have been dreading is now here so guess I will have to get past the denial stage. Meanwhile, before I fully accept the season I am going to ease in with something that has been with us since the first days of the markets in the form of tender green and delicate scapes to the now fully developed mature parchment covered heads. Garlic. I mean really, what can’t you eat garlic with? Pretty hard-pressed to find a culture that does not use the ‘stinking rose’ culinary or medicinally. Okay, the Irish and Brits were slow to jump on the band wagon, but I think they are fully engaged now. Pretty sure my Irish grandmother never used a clove of garlic in her cooking. On the other side, my Ukrainian grandfather was big on consuming cloves of garlic, and ya wonder why he lived into his 90’s. Actually quite pungent when raw, garlic mellows and sweetens when cooked. And the finer the chop, the stronger the taste, ie. crushed is way stronger than a whole clove – guess that explains why the infamous “Chicken with 40 Cloves of Garlic” is completely overpowered by intact 40 cloves. Look for firm, dry heads that are covered in plenty of the parchment-like skin. Signs of green shoots? Too old. 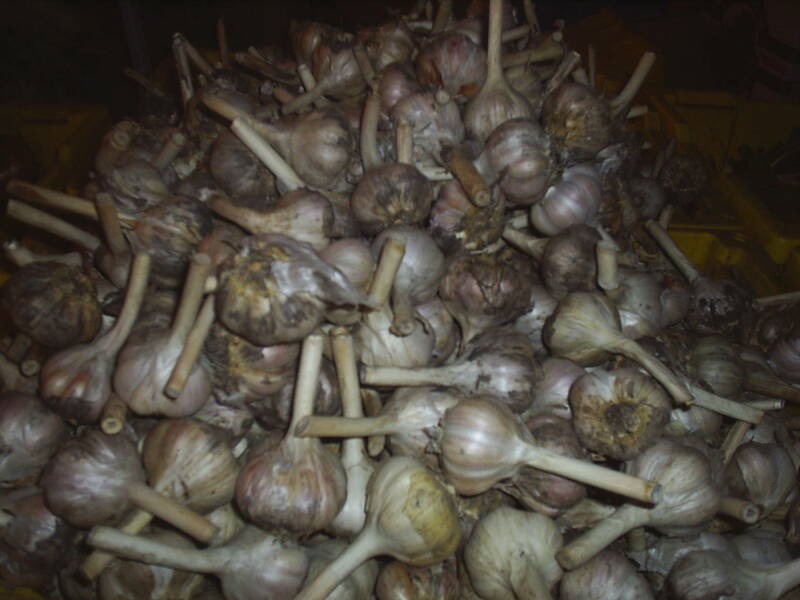 Each head of garlic should yield between 10-20 cloves of garlic depending on the variety. 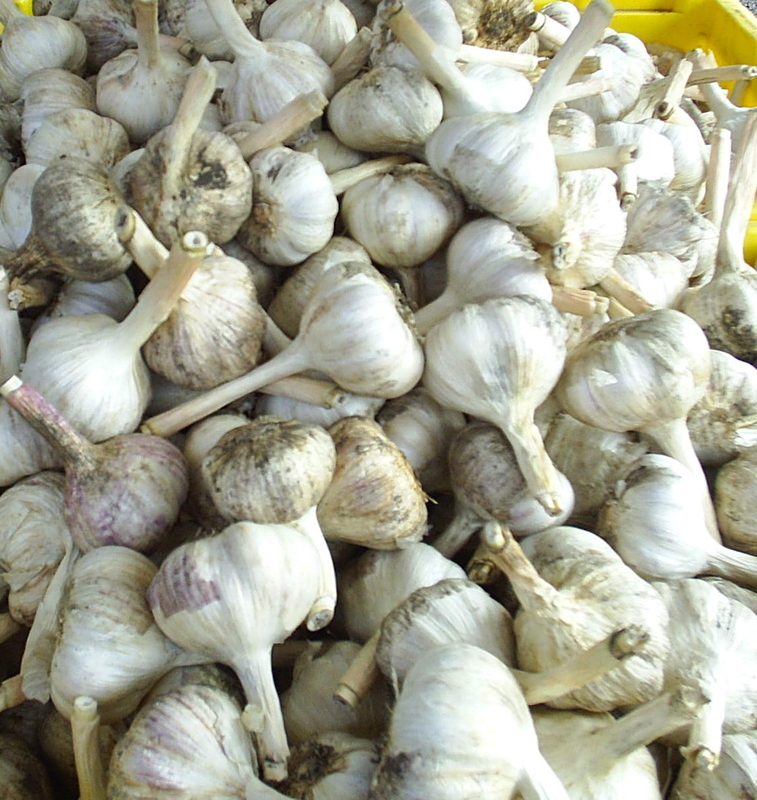 Garlic needs to breath, so store garlic in a cool,dry spot out of direct sunlight. DO NOT store in the fridge or in oil. How long is it going to last? Well that all depends on the age, variety and how the garlic was handled when harvested. 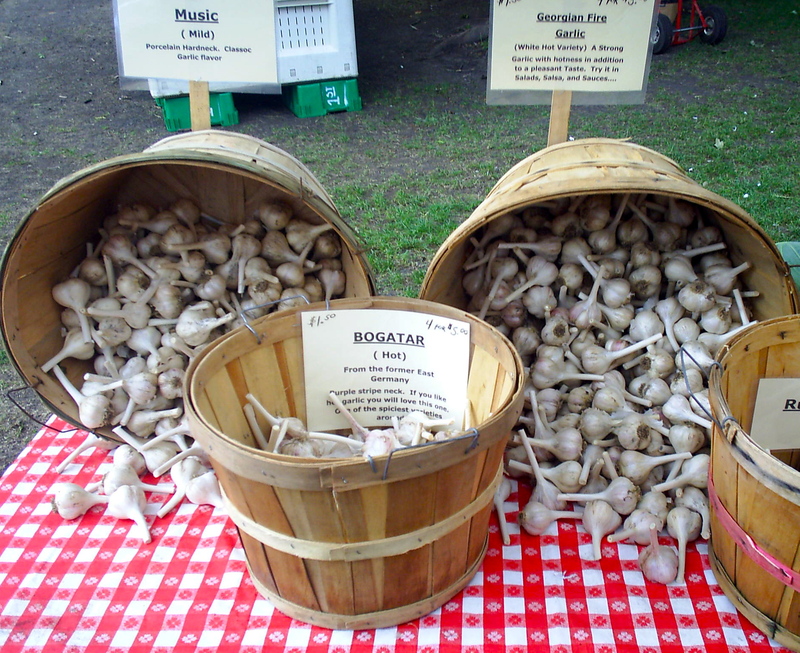 But, being that we only have a last lingering outdoor market this weekend, The Evanston Farmers Market, (no worries indoor options are available, like Green City, the French Market and Logan Square and Glenwood Sunday Market) so start stocking up on heads of garlic. Since it is now cooler and ovens all over the city are being turned on, here is easy and scrumptious way to enjoy all those heads of garlic. Preheat oven to 300 degrees. Cut the top 1/3 off the garlic head. Place garlic on a piece of foil. Drizzle olive oil on garlic. Sprinkle sea salt, pepper thyme and lemon zest on garlic head. Wrap foil tightly. Roast in oven for 1 to 1 1/2 hrs, until garlic is soft and golden. Use to slather on crusty bread or mix into mashed potatoes, or garnishing grilled chicken, beef or fish. This entry was posted in To Market with Mo and tagged Andersonville Farmers Market, Chicago Area farmers marekts, Chicago Farmer's Markets, Evanston Farmer's Market, Farmers Markets, fresh organic, fresh seasonal organic produce, garlic, Glenwood Sunday Market, Green City Market, moira's blog, Nichols Farm, roasted garlic, stinking rose, sustainable, to market with mo. Bookmark the permalink.